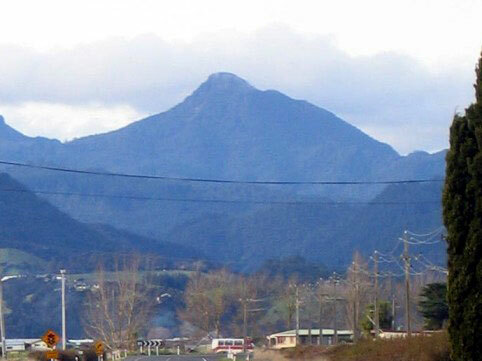 Kaitarakihi is a very prominent peak sitting in the southern section of the Coromandel ranges, just south of the more famous Pinnacles and Table Mountain. At 852m asl, it is taller than both of these neighbours. The starting point for track to Kaitarakihi sits at the summit of the Kopu Hikuai Road (SH 25a), on the North side of the road. However the parking area is on the south side of the road. It is easy to fly past the saddle, and it isn’t so easy finding a safe place to turn around if you do! The bends in the road provide poor traffic visibility so take care to look out and give plenty of notice and indication. You will need to cross the highway to the track. Again take care. From the tracks starting point you head fairly steeply up into bush before some undulating travel under bush cover. It is a while until the peak comes into view, but once it does the action begins soon after with a steep scramble up exposed slopes to the summit. The views to the south and west are excellent although views to the north are blocked by vegetation. The track continues on and turns into a route to Hihi but our prescribed route is simply to return the way you came to the carpark. There is a small side trip to a large Kauri tree which you may want to take on the return leg.